If you are charged with inspecting, maintaining, or performing other Fall River hydraulic hose services as part of your business or job as an employee, it is important to learn all you can about the various components that are included in a hydraulic hose assembly. 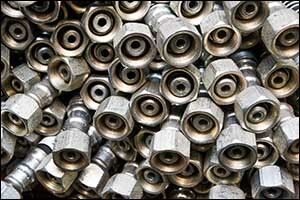 At first glance, the average assembly is simply a length of hose with a fitting on each end. Some assemblies are more specialized than others to meet the requirements or demands of the equipment. Other variations can be found in the type of hose, such as being made specifically for high-pressure or low-pressure situations, and the connections themselves based on the environment in which the equipment will be used. Purchase your replacement parts from a trusted hydraulic hose shop near Fall River, such as Metro Industrial, where you can get hydraulic hose clamps, assemblies and hoses custom selected to meet your needs. Whether you purchase standard or custom hoses in Fall River, all hydraulic hoses have three primary components. The materials and techniques used with each component are what makes each type of hose different from the others. Understanding how hoses are created and the common materials used in their design can help you to make smart choices for your equipment when you require Greater Fall River hydraulic hose services. The Tube – This layer is found deep inside of the hose. The purpose of the tube is to convey the hydraulic fluid or other media from one end of the hose to the other. It is also designed to protect the outer layers from the effects of the media. The Reinforcement Layer – This layer essentially provides the strength of the hose itself. Various techniques and types of materials are used to achieve this, depending on the use of the hose and the strength requirements that are needed. Braided, spiral, and helical are some of the design types used in the reinforcement layer of hydraulic hose. The Cover – This is the outside layer of the hose, and it is designed to protect both the reinforcement layer and the internal tube from the impact of the outside environment. Chemicals, weather conditions, temperatures, abrasives, and other environmental issues can increase the wear on the hydraulic hose. Stronger covers can be used for heavy-duty equipment or use in extreme environments. To provide strength and proper connections for the custom hoses in Fall River, the fitting components are typically made of durable materials, such as stainless steel, carbon steel, and brass. There are two primary components within the common fitting that are selected based upon the type of hose, equipment, and use of the finished assembly. They must meet a variety of specifications and can be custom made at our hydraulic hose shop near Fall River. Hydraulic hose clamps and other accessories may also be needed, depending on your situation. The Socket – This is the part of the fitting that is designed to go over the outer cover of the hydraulic hose itself. It must be the right size and type to ensure a proper fit. The Stem – This is the part of the fitting that goes directly into the inner tube of the hose. The connecting end of the fitting is designed to help the hose connect to all of the other components within the machinery or equipment. For best results, referring to the manufacturer’s recommendations within the owner’s manual will help you choose the right hose and fitting for your needs. However, if you do not have access to this information or need assistance in choosing the best set-up for your equipment, our Greater Fall River hose services can be of assistance. Provide as much information you can about the equipment and how it is used, and bring in the worn hose assembly to our hydraulic hose shop near Fall River so we can create a custom replacement. The hose and fitting also need to be assembled using the recommended procedures. This is not something you can do for yourself. The proper method and equipment must be used for crimping and assembly, as well as the overall finished length of the application. If you need custom hoses in Fall River and the surrounding area, visit Metro Industrial at our shop in New Bedford, MA. We can provide you with a wide range of industrial supply and services designed to meet your specific needs and requirements. Give us a call at 508-996-8400 or visit our website for hours and directions to our hydraulic hose shop near Fall River.